Many women dread the prospect of losing their hair as it is often their hair that they feel defines the personality and depicts feminism but for some this event can occur for a umber of reasons and can significantly impair their confidence and self-esteem. Hair loss does not just simply mean that all the hair from the scalp is lost as there are actually different types of hair loss in women. Androgenetic alopecia is a form of hair loss in which may begin by the hair thinning eventually leading to patches of baldness or complete hair loss after a time. This is more common after the menopause as it is determined by hormones but can be related to genetics as well. Another form of hair loss is known as telogen effluvium identified by the loss of hair over a wide area. This is usually related to a reaction to stress, medications or illness and happens very often during life and can be linked to the cycles of hair growth. Alopecia areata is the last form of hair loss and occurs as a response to the immune system processes causing the hair follicles to become smaller eventually becoming non-functioning. The main causes of hair loss are because of genetics, stress, hormones balance, illness and medications. When stress is the cause, it is usually directly linked to some kinds of trauma or emotional occurrence that has had a profound effect on the body. It may also be as a response to poor nutrition often because of starvation or crash dieting. Some illnesses and medications can cause hair loss the most commonly known being during and following chemotherapy treatments for cancers. Trying to prevent the hair loss in the first place is important for managing this problem.For those with almost total hair loss the option of using a prosthetic hair piece may be considered. Gone are the days of having to wear a thick polyester hair piece as research, technology and general usage have all improved the choice of pieces available although often these carry a high price tag. If you have lost your hair because of legitimate medical reasons such as from receiving chemotherapy,. You may be entitled to financial help gaining a suitable hair piece. If you are found to have hormone imbalances and they are greatly affecting your physical or mental health, it is important to discuss your concerns with your GP who may be able to recommend some medications that may help resolve the imbalances. There is also a huge market for hair re-growth products though the results of these vary between users and may depend on the underlying cause of your hair loss. For those with permanent hair loss the option of using a hair transplant method may be considered. New techniques are a lot more viable than previous techniques and can be carried out using microscopic technology rather than by using large amounts of tissue and hair from elsewhere on the body or from a synthetic source. As stress is seen to be a cause of hair loss it is important for those who feel they are under a lot of pressure and stress for what ever reasons to try and find a suitable coping mechanism. For some this may be through exercise, a hobby or even from singing and music.Pregnancy and the period following the birth can also be a time when hair loss is experienced so measures can be taken to try and prevent this. A happy and healthy pregnancy will help to try and keep hormones at a more even keel, but also by using suitable hair products and conditioning agents may contribute to having more shiny and lustrous hair. It may be beneficial to speak to your hairdresser for more tips on how to maintain healthy hair during this time. 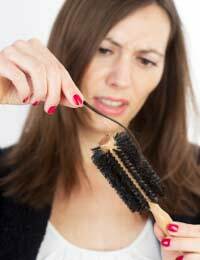 Although it does not directly endanger life losing the hair can have a significant impact on the life of a female and it is recommended than you see your GP and discuss the problem in order to determine if there is an underlying cause. Hi i stop the pills 6 weeks ago and i still dont have my period and i am not pregnant. What to do?